As a student of General Assembly’s User Experience Design Course, I chose a final project topic that was both a proven need in the marketplace and of deep personal interest: friendship-building amongst recently relocated millennial women. I was responsible for synthesizing user research and customer feedback to design and iterate on a solution, and for producing a full suite of UX documentation. In this case study, I’ll walk through each stage of my design process and illustrate key considerations that shaped the MVP of my final product, GIRLSQUAD: a native iOS application that helps millennial women cultivate rich friendships after moving to a new city. Millennial women who have recently relocated need a way to nurture genuine friendships in order to be happy in a new city. Consider this: Millennials are relocating at significantly higher rates than in the past. 59% of millennials (18-35 year olds) currently live in a locale other than their hometown. 80% of millennials have moved at some point in their lives, not including moves made to attend college. Along with relocating comes a big social challenge: Millennial women find it difficult to make friends after moving. 85% of users interviewed agreed that it’s difficult to find friends after moving. 100% of users interviewed agreed that it’s easy to meet people, but difficult to turn those acquaintances into deeper friendships. 43% of users interviewed want to bring disparate pockets of friends together to form a core group. Here's a closer look at the insights I garnered from interviewing 7 millennial women. Time spent together is crucial - best friends have known each other for years, and new friendships progressed quickly when a lot of quality time was spent together in person. Similarity in identity, personality, and interests is important for building friendships. Familiarity & knowing each other well is a key indicator of a deep friendship. Millennial women need a way to cultivate current acquaintances into friendships, not meet new people altogether. This denoted a major pivot in my vision for the product — I nixed the idea of creating yet another "Tinder for Friendships," and instead decided to concentrate on enriching existing relationships. There is no shortcut for spending quality, in-person time with a friend. This insight persuaded me to focus my product on facilitating interesting, shared experiences between friends. Current methods don’t work when they are superficial (ie. networking groups or Tinder-like apps), or bring extremely different people together (ie. Meetup). This is why the GIRLSQUAD MVP will start with curating local, "off-the-beaten path" events that will inspire conversation and genuine bonding, rather than prompting people to grab coffee or drinks. Meetup allows users to organize and attend local, interest-based groups and events. 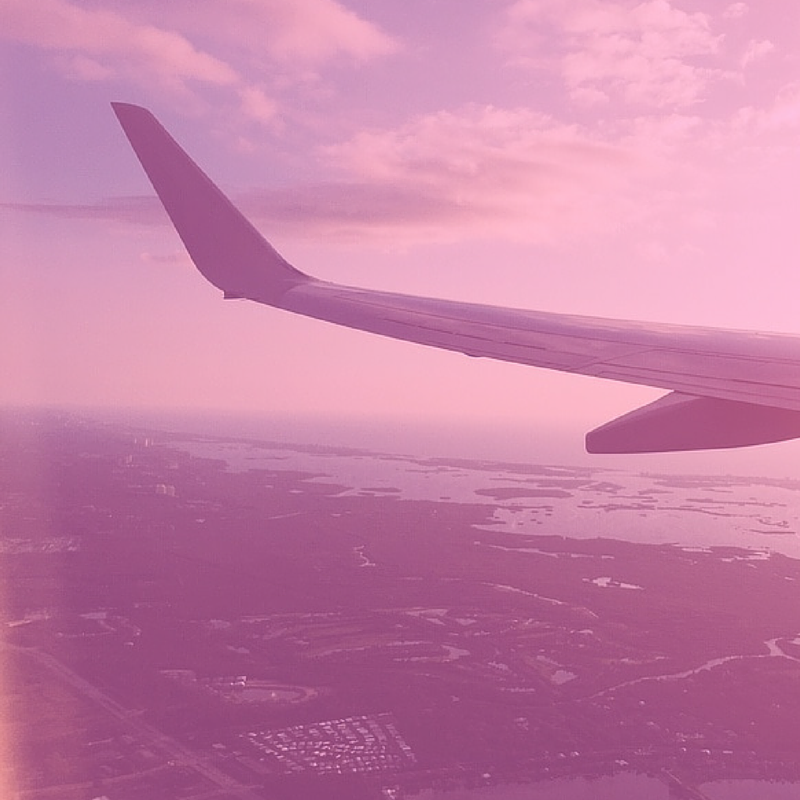 Its onboarding process is simple and facilitates immediate interaction: the user chooses her location and interests, and Meetup suggests relevant groups to get involved with. Meetup's home screen is also easy to navigate, displaying pertinent information such as the user's notification, next Meetup, and nearby groups. Finally, its design is clean and light with friendly, accessible branding based on the "nametag" aesthetic. Bumble BFF is the platonic subsection of Bumble, a Tinder-like dating app where women are encouraged to make the first move. Bumble BFF employs the same interactions as Bumble: users browse profiles of potential friends, and get introduced via chat when a mutual friendship match is made. It's extremely easy to get started with Bumble BFF, especially if the user connects her Facebook information, and equally as easy to get connected with other women — simply swipe right to denote interest, or swipe left to denote disinterest. Lastly, its branding is bright, and its copy is casual and female-friendly. Like Bumble BFF, Hey! 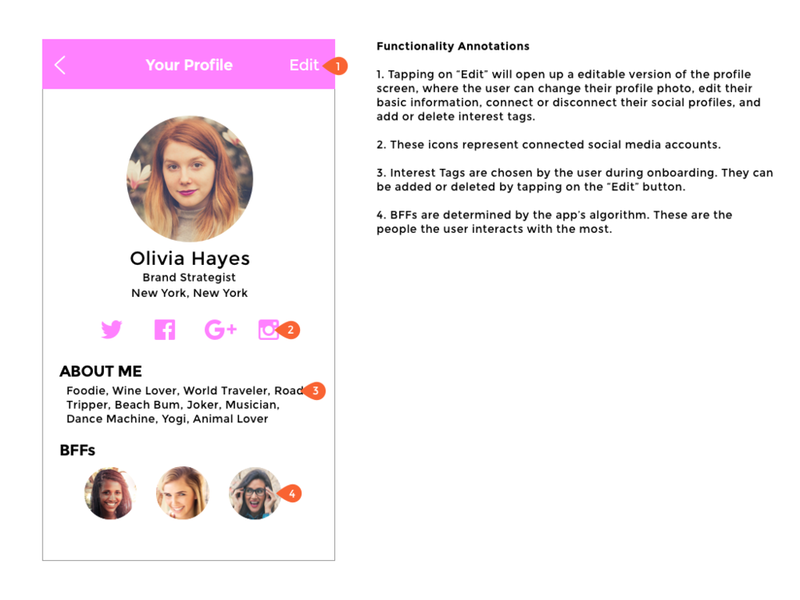 Vina also connects women with potential friends using the Tinder method, but with a personalized twist: users are served suggested profiles based on mutual interests. Setting up a profile in Hey! Vina is easy because of its Facebook integration and its quick, six question personality quiz. However, the app seems primitive and poorly built, as features are wonky and not always functional. Finally, Hey! Vina is female-focused with feminine fonts, messaging, and marketing, and has a more professional and polished brand persona than Bumble BFF does. Unsure if this is revolutionary or any different than the standard Tinder model. Again, you are introduced to potential friends, but the product does nothing more to further enrich that relationship. Millennial women need a way to strengthen superficial acquaintances into deeper friendships, as 85% of users interviewed agreed that it’s difficult to cultivate genuine friendships after moving to a new city. Facilitate genuine friendships between millennial women by curating interesting shared experiences for friends to attend together, ultimately helping them create a stronger, closer bond. GIRLSQUAD focuses on strengthening existing friendships, instead of meeting new people altogether. This means facilitating in-person quality time, rather than matching the user with other random users. There is no romantic stigma attached to GIRLSQUAD. If the user wants to see more details about a friend, clicking on that friend’s “Profile” will take her to a "Friendship Page," where she can see memories they’ve shared together. GIRLSQUAD has a big emphasis on personalization, and will curate a handful of quality events specifically for pairs or small groups of friends. 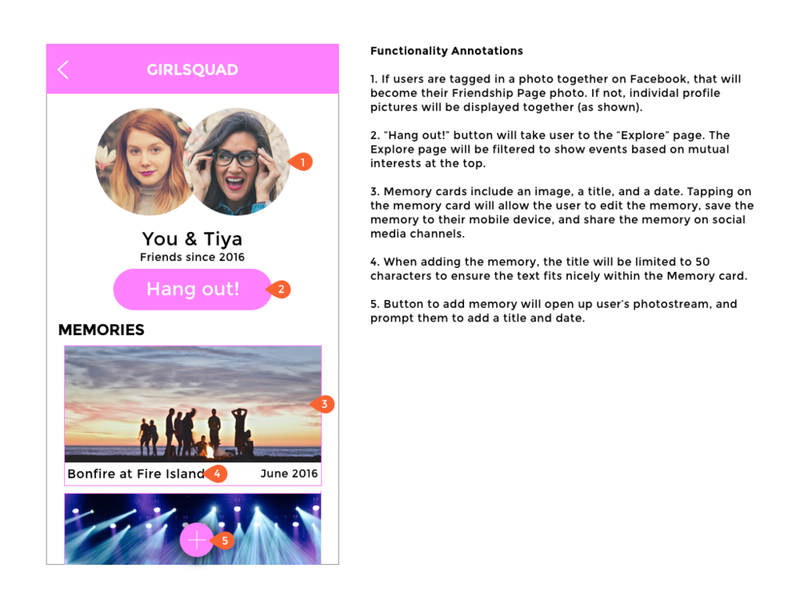 Focusing on the "Friendship Page", rather than individual profiles in “Your Friends” — This speaks directly to GIRLSQUAD’s emphasis on relationships. Making the CTA to “Hang out!” top priority in the information hierarchy — Making the CTA easy to find will help encourage action from the user. Organizing “Events” in a more logical way — I originally had a separate flow for "Event Feedback” under the Friendship Page, but it makes more sense to have all event-related pages together. It’s also important to clearly differentiate “Upcoming Events” and “Explore Events,” because the user will interact uniquely with the information on those pages. The second version of the Site Map reflects the actual the MVP. The pages are more streamlined, as I designed only the crucial screens for the clickable prototype. 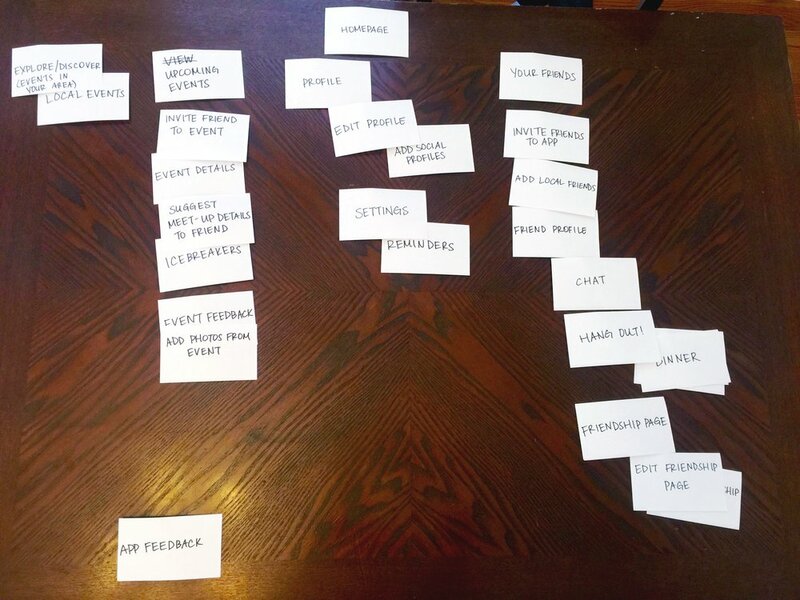 To help guide my design process, I created a "happy path" user flow early on during the project. This represents the ideal path that the primary user takes — from how she decides to use the app, to setting up her profile, to inviting a friend to an event. I've also broken down this initial user flow into three separate task flows, where you can see the actual screens for: new user onboarding, discovering events, and inviting friends to an event. 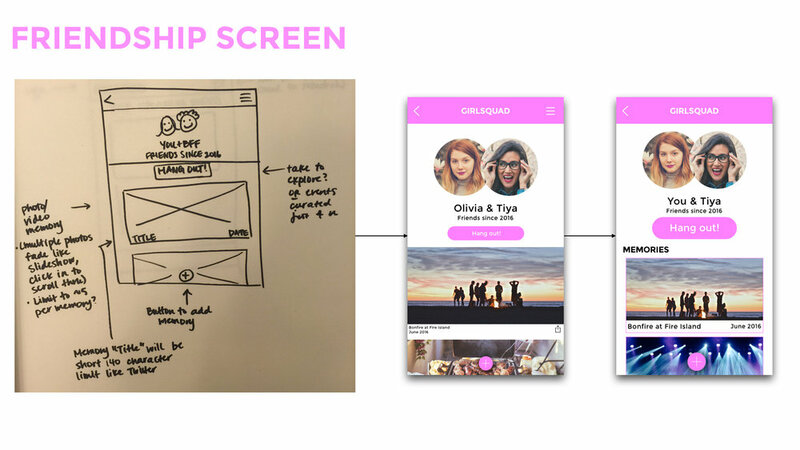 From ideation, to sketching, to high-fidelity wireframes, here is the evolution of GIRLSQUAD's key screens. You'll see the progression of my understanding of iOS design patterns: bigger buttons, proper use of the "back" icon, and standard navigation. You'll also see the grouping of relevant information into cards, enabling users to quickly understand the content of each screen. Lastly, you'll see that a few elements have been taken out — like the icons on the home screen, and "Friends who'd enjoy this event" on the event details screen. These changes were made after several rounds of user testing in order to eliminate confusion, and simplify the user's decision-making process. Note: You can click on each image to enlarge it. For this version, you can only invite Tiya to an event. Inviting through the Friendship Page has an extra step to select a friend (which, in the working app, should already know which friend you selected because you went through the Friendship Page). Inviting through the Explore & home screens have the correct flow, but blanket text for the invite message (it says “Daybreaker dance party” for all events). As with any project, there is always room for improvement. I've learned that user testing delivers incredibly valuable information, and would have liked to interact with more users had I had more time in the class. I also would have liked to send out a survey in addition to my 1:1 interviews to gather more data during the initial user research process. In terms of designing the screens itself, I would've enjoyed spending more time creatively problem-solving user flows. I decided to eliminate design elements that caused confusion, but there may be better, more innovative ways to solve for that confusion. Lastly, I would spend more time contemplating the home screen. Since it's a strong anchor for the user experience, it requires further exploration about how well it achieves the goals from my product design statement. Looking forward, there are a few design exercises I could play with: building engagement and retention into the product model, ways to monetize the product, and building out the next version of the MVP. Here's to helping every #girlboss find their GIRLSQUAD!